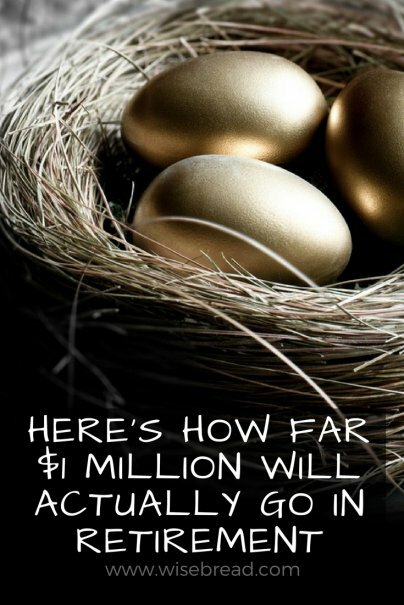 For years, saving $1 million for retirement has been on my nest egg to-do list. Using the 4 percent rule, where you withdraw 4 percent of your savings each year during retirement, a million dollars would produce a hypothetical income lasting up to 33 years. That seems like a nice round number and reasonable goal, especially with the traditional retirement age holding steady at 65 and the average American living for 20 years after retiring. GoBankingRates compared the cost of basic living expenses in each state and found the length of time a million dollars lasts varies significantly across the country. In Hawaii, a state with the highest cost of living index, you could run out of cash in under 12 years. Unless camping out on the beach while subsisting on pineapples is your thing, Hawaii may not be the best option. On the other hand, there's Mississippi. That same nest egg would last 26 years in the Magnolia State. Mississippi has the lowest cost of living index in the country. A retiree could live comfortably paying just $11,000 a year for housing. You may not be able to visit the white sandy beaches of Oahu, but the Gold Coast is nothing to sneeze at. In addition to housing, the cost of living index accounts for basic necessities like food, taxes, and health care. Some states, like Vermont, tax Social Security benefits. Florida residents have the lowest Social Security payout, but they don't pay state taxes on those benefits. I like my hometown. Chicago may not top the charts on any best-place-to-retire mega list, but access to my extended family, proximity to my future grandchildren, and a vibrant walkable city with great public transportation options may still be quality of life factors I value in my golden years. Staying put may be desirable even if your hometown doesn't make a "where to retire" hot list on the internet. Determining your retirement savings goal should start with where you plan to live and how much it will cost to live there. Roger Wohlner, a financial adviser with The Chicago Financial Planner, advises would-be retirees to consider a number of options. Calculating a retirement savings goal is different for everyone. "Are you going to have a mortgage? Are you going to move somewhere else and downsize? What are you going to spend your money on? It's really no different from how you live pre-retirement," he says. Most of all, he suggests we factor in health care costs into any post-employment savings projections. "As you get older, [medical expenses] are more pronounced in retirement," Wohlner says. Fidelity's annual study on health care costs found that a retired couple can expect to spend $275,000 on medical expenses during retirement, not including long-term care. And health care costs are rising well beyond the rate of inflation: The increase in medical spending from 2016 to 2017 alone was $15,000. With your basic living expenses in mind, estimated health care projections, and a few dollars thrown in for hobbies — like traveling or spoiling the grands — head to your nearest online retirement calculator. In either case, determining your retirement goal should be an annual exercise, according to financial experts like Roger Wohlner. "This is not something you just do once. Circumstances change. People should really be updating this calculation every year," he says.